The Rhumbelow Theatre at Tina’s Hotel in Kloof offers a wide variety of music tribute shows and revues. These are usually based on the great rock musicians of the latter part of 20th century, or compilations of their music. One is inclined to forget that there is also a huge treasury of music of a gentler and more thoughtful nature, which may be a little more serious and sometimes just a bit maudlin. The music of the fabulous singer/song writers, and folk musicians of the time. That is where Eshowe based guitarist and singer, Dave Starke, steps in to correct the balance. After his recent homage to the music of Lenard Cohen, he is back on the Rhumbelow stage with a tribute to two of the greatest singer/song writers of them all, James Taylor and Carole King. Joining Starke on stage for this production is a petite young lady with the intriguing name of Two Bit Mac in a debut appearance at a Rhumbelow venue. James Taylor was a troubled character. He was prone to depression and had several visits to psychiatric hospitals. He also suffered from a serious heroin addiction. His personal life was also traumatic, and he was married several times. Despite this he was a prolific songwriter, both for himself and for other artists. He won five Grammy Awards and is regarded as one of the bestselling artists of all time having sold more than 100 million albums worldwide. He was inducted into the Rock and Roll Hall of Fame in the year 2000. Much of his music reflects his personal woes and can be melancholy and depressing. Stake captures this mood perfectly. He is an accomplished finger-picking guitarist and has a smooth singing voice. He does great justice to the James Taylor songs on the programme which includes hits such as Sweet Baby James, Something In The Way She Moves, Carolina In My Mind, Fire and Rain, You’ve Got a Friend (a cover of a Carole King song) and You Can Close Your Eyes. He also gave examples of Taylor performance of a blues number, Steamroller Blues, which was great fun, and a Country and Western number, She Thinks I still Care. Carole King and James Taylor are long-term friends and collaborators who have known each other for over 50 years. She is one of my all-time favourite female singers, so it was a disappointment that the show was skewed very much in the favour of James Taylor’s music, with only a few of King’s songs featured. Like Taylor, Carole King was a prolific songwriter, both for herself and for many other artists. She has sold 75 million records worldwide, and her wonderful album Tapestry held the record for most weeks at No. 1 by a female artist for 20 years. The very impressive Two Bit Mac performed two of her songs which were the highlights of the show. They were Way Over Yonder and Natural Woman. She also sang harmony and backing with Starke on a few other numbers during the show. She has a rich, soulful voice and has plenty of power for such a diminutive young lady. I would have liked to hear much more of her. And the story of her name? the Two Bit comes from her size (two bits and a tickey high) and the Mac from the family that raised this South African born girl in America. A Tribute to James Taylor and Carole King is a straightforward show with no fuss and frills. During the show Dave Starke imparts considerable biographical information about the lives of the two artists which puts their influence on the music industry into context. This show is well-performed and will appeal particularly to lovers of this genre of music as well as fans of James Taylor and Carole King. 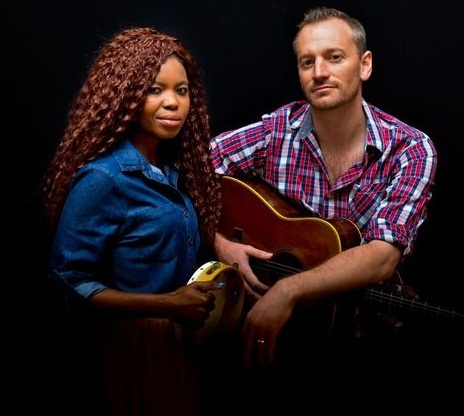 A Tribute to James Taylor and Carole King can be seen at the Rhumbelow Theatre at Tina’s Hotel, 4 Beryldene Road, Kloof.